A memoir about perfume from anyone other than a perfumer seems unlikely—unlikelier still that such a book would raise questions about gender, community, family history, class, and expectation. So it’s fitting that unlikely is one of the keywords here to Alyssa Harad’s memoir, Coming to My Senses: A Story of Perfume, Pleasure, and an Unlikely Bride. There’s much to love about this book—the lyrical words, the sensual descriptions of various perfumes, the ongoing navigation of bridedom—but what I appreciated about it above all was the way it reconciled feminism with what one might label “the feminine arts.” (Though as Alyssa’s story of having a sniff-fest with a transgendered friend of hers shows, fragrance is hardly limited to the feminine.) I felt a pulse of recognition throughout: The tale of learning to ease the imagined divide between the pleasures of perfume (or makeup, or a perfectly crafted shoe) and the idea that as a feminist, one “should” be concerned with serious matters like Injustice and Legislation is one that I’m guessing plenty of readers here will identify with. Enjoy the excerpt below that expands on this idea—and leave a comment to be entered to win a signed paperback copy of Coming to My Senses, plus two samples of perfumes that appear in the book. [Edited to add: Giveaway open through 11:59 p.m. ET August 12, 2013.] West Coast readers can catch Alyssa at one of her upcoming events: August 1 in San Francisco, August 3 in Los Angeles, August 7 in Portland, and August 12 in Seattle. (More details here.) Coming to My Senses can be found at independent booksellers (and the behemoths too). If the center of the Kingdom of Women is a gleaming white-walled city built by movie executives and ad agencies, where supermodels, screen goddesses, and all the perfect girls we knew in high school fill the streets, I live far outside the city limits, beyond the suburbs, a few counties over, in a country village founded by a lesbian feminist collective in the mid-1970s. (Before that, it was a summer retreat for bohemians, and there’s still a strong artsy contingent.) I like it there, away from the glitz and the glare. In our softer, plainer light, it’s easier to see how many ways there are to live as a woman, how many forms and shapes there are of beauty, energy, work, and wisdom. There’s a lot of fresh air, and I’m surrounded by people quietly and not so quietly staking out new territory on the map, so that there are days, sometimes weeks, at a time when the category woman, as an immutable opposite of the category man, doesn’t mean much, and it’s easier to use the word person, which is a word I’ve always liked. It’s a place where small details are important—a new pendant, a line of silver buttons, a charmingly crooked tooth, a pair of particularly fine clear eyes. I didn’t always live so far from the center of the kingdom. I started out more or less where my mother lives now, in the neat, well-kept suburbs just outside the city walls. In the Kingdom of Women (and sometimes in real life, too), the suburbs are all about being what my mother once called, with great approbation, well groomed. You’ve made the most of what you have, as though you were a country whose raw materials have been properly exploited. You’ve done a great job of putting yourself together, as though you were a chair or a car. It’s a learned skill, this self-creation, the territory of endless tips and tricks. Anyone who works hard enough, the theory goes, can be pretty (the corollary being that those who are not pretty do not work hard enough). To be well groomed requires an instinct for limits, boundaries, dividing lines. Money helps. (There’s a lot of shopping.) And free time. But for that mythical creature, the truly well-groomed woman, everything is effortless. The endless small adjustments and daily rituals of maintenance are as natural to her, and as expected, as breathing, walking, or using the telephone—say, to make a hair appointment. She notices her own polish as little as a former ballerina notices her perfect posture. Both are the result of years of practice. I’m being a little mean. There’s a hissing, a little meow in my voice, that tells you how much that world frightens me, and how much I admire it. How I have to go on escaping it because it is a part of me. Its rules are a test I will go on failing all my life. Because I was never a rebel, or at least I never meant to be one. (I may have refused to wear Lauren, but I longed for it all the same.) I wish there were a single story I could tell to explain what happened, but there isn’t. It was just a long series of negotiations, a no-I-won’t here and a yes-I-will there. An absurd number of these arguments had something to do with hair—all that cutting, combing, straightening, curling, waxing, shaving, plucking, bleaching, and spraying that was required of me, as though the moment I let my guard down I would become a snarling, thick-pelted animal. And it’s true, I always had a wild streak, a taste for drama. All through my growing-up years, even when I matched my socks to my turtlenecks and blew my thick, curly hair straight and then set it in hot rollers for good measure, I was always a bit too much. It was as though I were wearing a costume I couldn’t take off. A loud, curvy, dark-eyed girl in a land of cool, slim-hipped blondes, I spent a lot of time onstage, where I made more sense. There, and elsewhere—the lines between life and stage aren’t always clear—I played the roles that were available to me: the tough showgirl, the exotic gypsy, the lusty wench, the Egyptian queen, the madwoman. Even at fifteen, the ingenue was beyond me. By the time I was seventeen I was singing “Big Spender” at the local charity auction, and though I have no memory of doing so, my mother loves to tell the story of how I came down off the stage, microphone in hand, to sit on the seventy-eight-year-old lap of J.R. Simplot, the billionaire potato king. In college, I played prostitutes, unfaithful wives, and, once, a blues singer named Honeypot. It was pure instinct, all of it. So I went, skating along on this thin ice until the moment in my early twenties when feminism came along and plunged me into the cold, dark waters below. Dripping wet, but wide awake, I looked upon my double life with horror—prim constraint on one hand, a series of self-betraying stereotypes on the other—and in my usual earnest, censorious way, chucked the lot. It never occurred to me that I might be throwing away some things I wanted to keep. And that’s where I was, more or less, fifteen years later when, having long forgotten most of what I’ve just told you, I sprayed on a bit of Paloma and went home to lie on the bed and ignore my mother’s e-mails about whether the napkins at the wedding reception should be brown or gold. 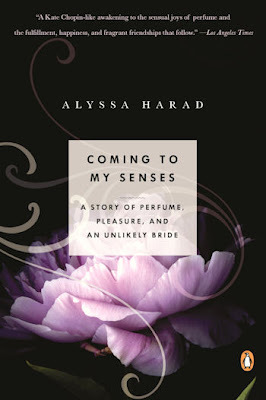 From Coming to My Senses: A Story of Perfume, Pleasure, and an Unlikely Bride by Alyssa Harad. Reprinted by arrangement with Viking, a member of Penguin Group (USA) LLC, A Penguin Random House Company. Copyright © Alyssa Harad, 2012. The excerpt makes it sound like most women fall neatly into one of the two realms of traditional femininity and the reactionary feminists. I'm assuming that the rest of the book is about finding a middle ground. "It never occurred to me that I might be throwing away some things I wanted to keep." How many of us have similar stories of trying to find a balance in the middle. Beautifully written...cannot wait to read the rest. This is really interesting. I have a great love for perfume. When I was in France, we went to a perfumerie - not far from where they make Chanel 5 - and I bought the first perfume that people could actually smell on me. (That, or no one saw fit to compliment me on my aroma, which is highly probable). I've always loved perfume, and to an extent, deodorant. It just smells REALLY nice. I love it when someone smells nice - when someone walks past you and their cologne or perfume is noticeable but not overwhelming. I love to go into stores and smell everything. Even in magazines where they have the cologne strips, I like to inhale those too. I've never perceived perfume as feminine, or part of what I call "beauty work". To me, having perfume is similar to having really nice body wash or a soap with a lingering smell. Perfume is just a bit more extra because it's not about hygiene (though, people did use to douse themselves in perfume before people had access to running water to cover up their BO). >how many ways there are to live as a woman, how many forms and shapes there are of beauty, energy, work, and wisdom. like the writing/tone a lot. I love the writing, would love to read the whole thing! Over the past few years I've become very sensitive to scents, even in things like shampoo or body wash and can't handle them anymore. This always makes me sad because I love the way scent can trigger memories. I can still remember the way my grandma always smelled as well as my first boyfriend. I can't wait to read the entire book! I am so tied to scents--I relate them to every memory. Such gorgeous and vivid imagery in this passage, thanks for the moment of beauty! Hi Janaya! Congrats—comment #6 (you) won the book and perfume sample set! Drop me an e-mail at the.beheld.blog@gmail.com with your mailing address. Thanks! Hi Janaya--I just left a comment on your Google Plus profile about this. Please send me your address by September 14--thanks! If I don't hear from you by then I'll have to pick another winner. So interesting!! Can't wait to read it. That is exciting and motivational. I hope you will navigate to this site for online helping source. Thanks for sharing. US President Obama, July 21 is a great historic day, because that Nike Free 3.0 V2 day he personally signed since the Great Depression of the nineteen thirties the most comprehensive, the most severe part of the financial reform bill to make it official This is the second into law in March after the health care reform bill passed by Congress, US President Barack Obama has won a major political victory annals of loading. Implementation of the financial bill from the US government Nike Kobe Shoes to fundamentally reform Wall Street regulations will Free Trainer 3.0 not only have an impact on the US Women Air Max Thea Print financial system, but also on global financial regulation to have a significant impact Obama noon, at the signing ceremony, he said that this reform represents the United States Historically the most powerful consumer financial protection, these protective measures will be a new consumer protection agency to perform the work of the agency is only one, and that is take care of consumers, rather than large banks, lenders, or investment banking He pointed out that through the financial reform is not only a good thing for consumers, the US economy is also a good thing. The purpose of the reform is to ensure that the financial sector follow the same set of rules, so that they compete on price and quality, rather than the skill and trap 'the American people will no longer pay for Wall Street's mistakes,' Obama said, this reform will terminate on large Bank bailout, if a large financial institution should collapse, then, the new legislation provides, without harm to the economy, authorities stripped the agency's capacity. No enterprise in the future due to their 'too big to fail' and to be protected in some way, the United States will not have another company Nike Free Dynamo American International Group, which is the meaning of reform Obama frank, through this bill is not an easy task To achieve this goal, we had to overcome a series of powerful interest groups lobbying activities, and opposition parties are determined to block reforms minority Republicans who strongly criticized the bill because few banks fault and punish the entire banking industry, government interference Another example of the economy. Some Republicans have claimed that if they returned to power in Washington, to repeal the bill. Public opinion, the bill also allows Obama Nike Free 3.0 V3 too many enemies, the Democrats will have a negative impact in the midterm Congressional elections, the deep pockets of Wall Street financiers will be able to favor the Republican Party to lead this legislation two Members of Parliament Sneaker Online named 'Dodd-Frank Wall Street Reform and Consumer Protection Act' on July 15 in the Senate, the bill is committed to protecting consumers and resolving financial sector systemic risk issues, aimed at avoiding a repeat of the 2008 financial crisis.